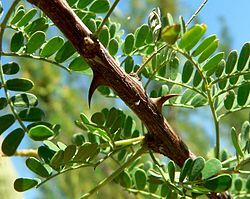 Wikispecies has information on: Acacia. ↑ "Evolutionary change from induced to constitutive expression of an indirect plant resistance : Abstract : Nature". www.nature.com. http://www.nature.com/nature/journal/v430/n6996/abs/nature02703.html. Retrieved 2008-04-20. This page was last changed on 21 April 2014, at 11:24.